Maker Carnival Chennai is a free-to-attend, community run event, which will be held on Saturday, February 2, 2019 on the AISC Campus at Taramani. Maker Carnival Chennai takes the form of a “Show, Tell, and Do” experience where inventors/makers sourced through an open call, will have an opportunity to showcase their creations in a fairground atmosphere, and invite the participants to have a go too. It is a family friendly showcase of invention, creativity and resourcefulness, and a celebration of the maker movement. It’s a place where people show what they are making and share what they are learning. Makers range from tech enthusiasts to crafters, educators, tinkerers, hobbyists, engineers, artists, science clubs, students and commercial exhibitors. They are of all ages and backgrounds, coming from all over Chennai and beyond. 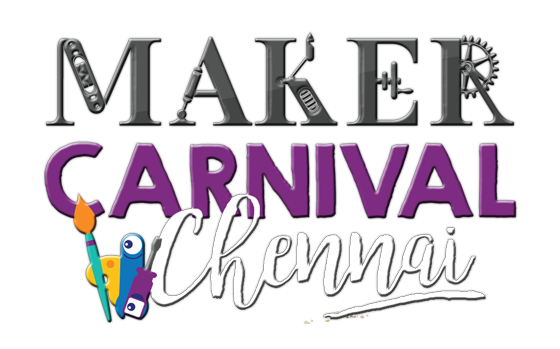 Maker Carnival’s mission is to entertain, inform, and connect the makers of Chennai, while inspiring the next generation of India’s makers and inventors. If you are a private or for-profit company, we would be happy for you to promote creativity and innovation, showing how your industry/products engage the “maker” mindset. We have a three tiered sponsorship model, which will provide options for all levels of business, and cater to all levels of exposure to our event audience. Please contact vgeetha@aischennai.org or msherriden@aischennai.orgfor details about being involved in the event. If you are a community (non-company) maker, or a school maker group, we would be very happy for you to promote your crafts and maker processes to our audience. School groups should focus on the students presenting their own work or crafts, not the publicising or advertisement of the school. Makers must focus on the “Show, Tell, and Do” aspect of the day. The booths must allow for a small creative experience, or hands on demonstration of the crafting process. Please get in touch with us to discuss your craft and maker activities, and we can work together to expose your work to a fantastic audience. Please contact vgeetha@aischennai.org or msherriden@aischennai.orgfor details about both the event, and the community/school booths we have available. We would love to welcome you to the Maker Carnival Chennai 2019! The event is free to attend, family friendly, and will be accompanied by a host of catering and entertainment options. The AISC Campus at Taramani is a beautiful site, and is the ideal place to host a celebration of creativity, fun and making. Please be aware that this will be a registration event. In order to attend you MUST be registered HERE. You will need the ticket (printed or on a mobile device) in order to attend the event. Arrive early for enhanced swag and merchandise on the day, as stock is limited! Register here, but please note that there is a limit of 750 tickets. Each ticket must be in the name of each person. Please contact vgeetha@aischennai.org or msherriden@aischennai.org for details about both the event, and check out the rest of the website for further details.